" This battery is great. We could finally leave the house while my son was on his Cpap machine. " " This battery seems to work fine. I have used it 4 nights (while charging it each day). It is small enough to fit in my regular cpap bag. " Looking for the peace of mind of knowing CPAP therapy is available when power is not? Does the CPAP machine stay home when you go camping or hunting? The C-100 Travel Battery Pack for CPAP Machines is an economical, lightweight power source kit including a DC cable and accessories used with many of the most popular brands of CPAP machines. The C-100 lithium ion battery weighs just 1.16 pounds. The weight of the pack including the carry case , DC power cord and AC charger weighs just over 3 pounds making it one of the smallest CPAP batteries on the market. Manufactured by Battery Power Solutions. 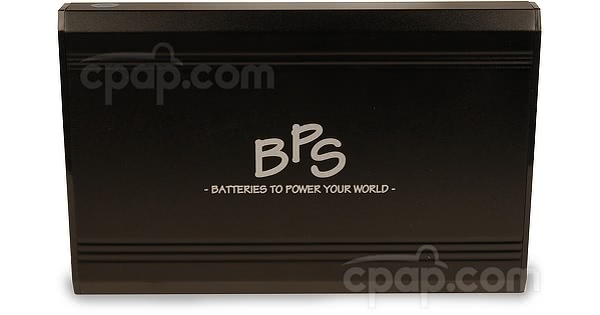 The C-100 Travel Battery Pack for CPAP Machines by Battery Power Solutions (BPS) is a small, lightweight Lithium Ion battery in a sleek design. More than just a battery, the kit includes the components needed to power many models of CPAP and BiPAP machines. 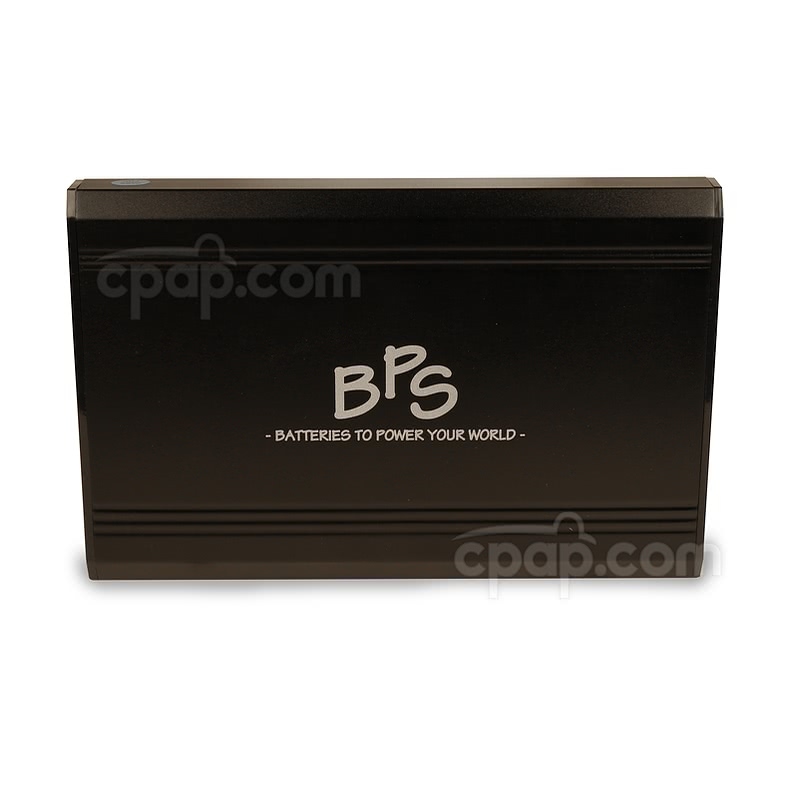 At just 1.6 pounds the C-100 by BPS is one of the lightest CPAP batteries on the market. The flat design of the battery makes it easy to transport and use. 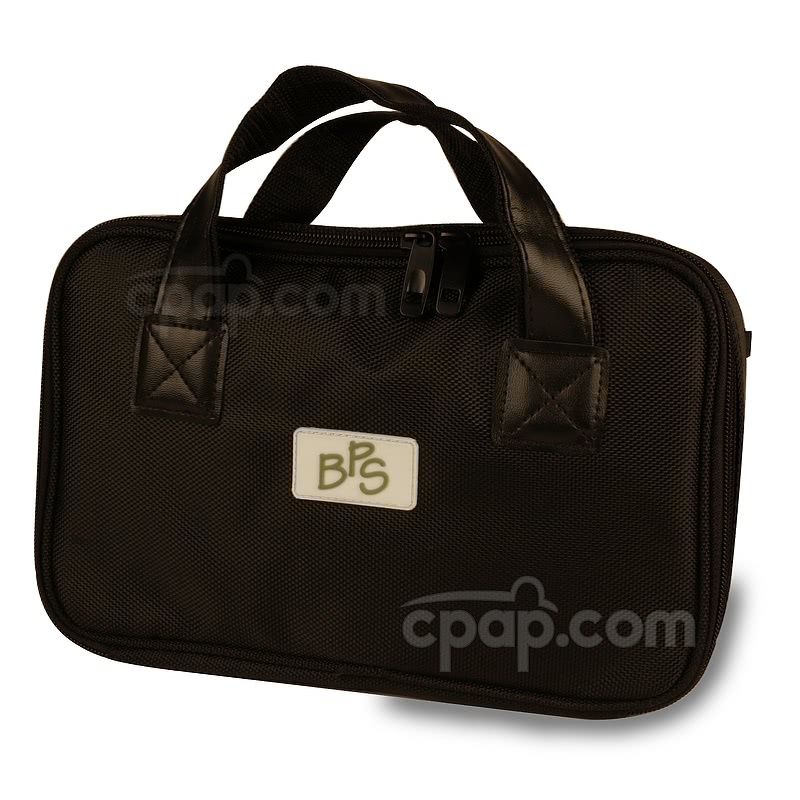 The handy carry case is designed to hold the battery and all components in one easy to use bundle. The BPS C-100 Travel Battery is powered by a Lithium Ion battery and complies with the FAA requirements for use when flying and sailing. Check with the specific travel carrier should you have any questions. The clever design of the carry bag included with the C-100 accommodates all included components as well as available accessories. 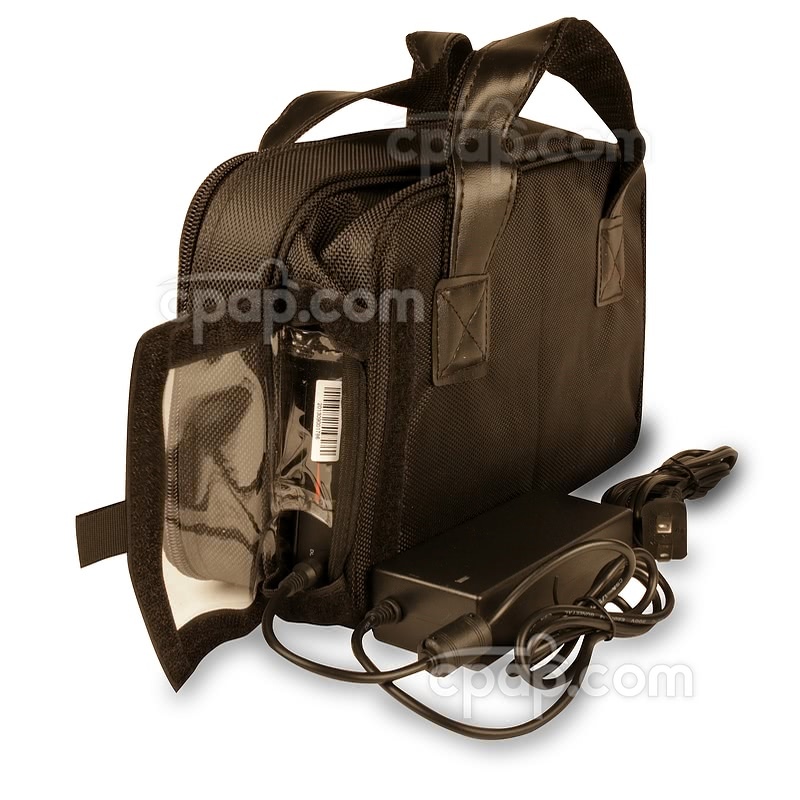 The battery is securely held in place in the bag by a pouch with Velcro closure. A flap on the side of the carry bag allows access to the battery to attach the charger or DC cable for use of the battery. The charge time from AC power with a completely drained battery is about 4 to 5 hours. The charge status can easily be seen through the clear flap of the bag. If desired, remove any components not required for use with your machine and store elsewhere to make the battery and case even lighter weight. 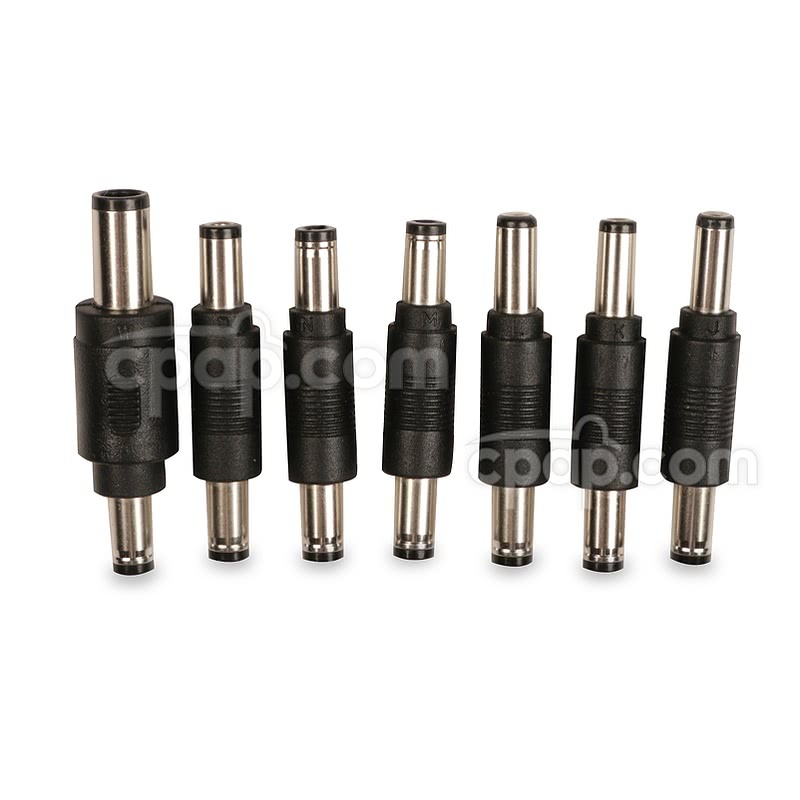 The C-100 Travel Battery comes packaged with 7 connector tips in various sizes. After plugging the pigtail connector to the battery, attach the appropriate sized tip to work with the machine being used. The letter size indicator is stamped on the black cuff of the connector tip above the barrel grip. PR System One 60 Series Machines: Tip "W"
PR System One 50 Series Machines: Tip "N"
Respironics M Series Machines: Tip "N"
DeVilbiss IntelliPAP Machines: Tip "N"
PB GoodKnight 420 Series of Machines: Tip "J"
Want to extend the run time away from AC power? 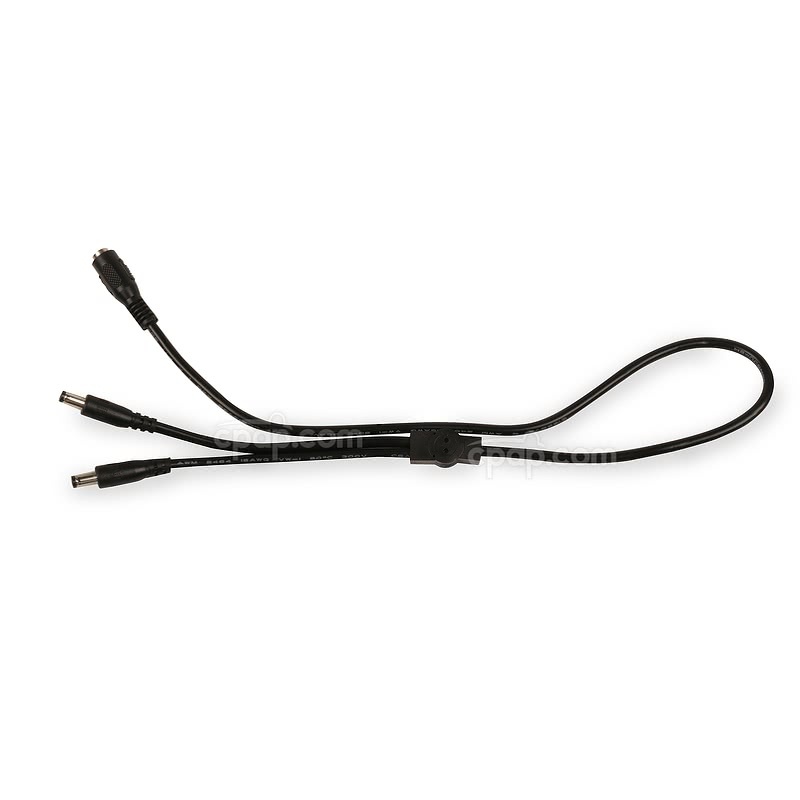 Consider adding an additional C-100 battery and connecting with the included pigtail cord. The pigtail cord can be attached to two batteries, which in turn is attached to the machine. When one of the batteries is depleted, the other one kicks in. For more information visit the C-100 Travel Battery for CPAP Machines - Battery Only page. 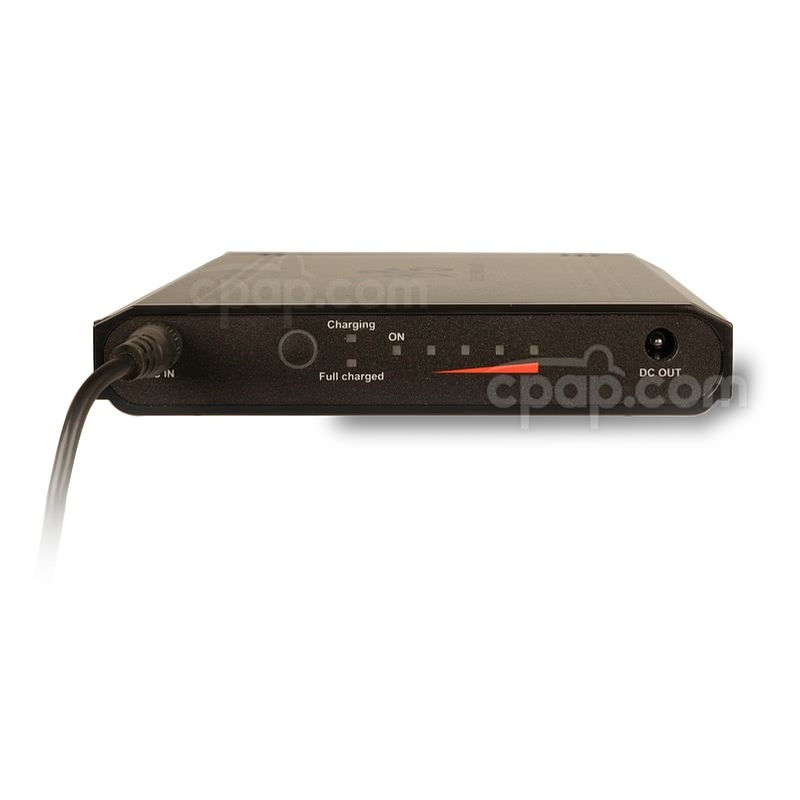 The C-100 Travel Battery for CPAP Machines is a movable, power source intended for short-term use. Because the battery has an input and output, the battery can be plugged into an AC power source to receive a charge while being plugged into a device to discharge. The C-100 battery will discharge its stored power to the device while simultaneously receiving a charge from the AC power source. The continuous charging and discharging occurring from the battery, will reduce the number of cycles remaining in the battery life. It is recommended only to set the battery in this configuration when a power outage is imminent, as this configuration will shorten the lifespan of the battery. If using a device that will draw a significant amount of battery charge, such as pairing a humidifier with a machine, it is recommended to have two battery cells to provide a longer run time. BPS offers the S9 Machine 24V Power Converter for use with ResMed S9 machines. To view it bundled with the C-100 battery visit this page: C-100 Battery Pack for S9 Machines Looking for the 24V converter alone? 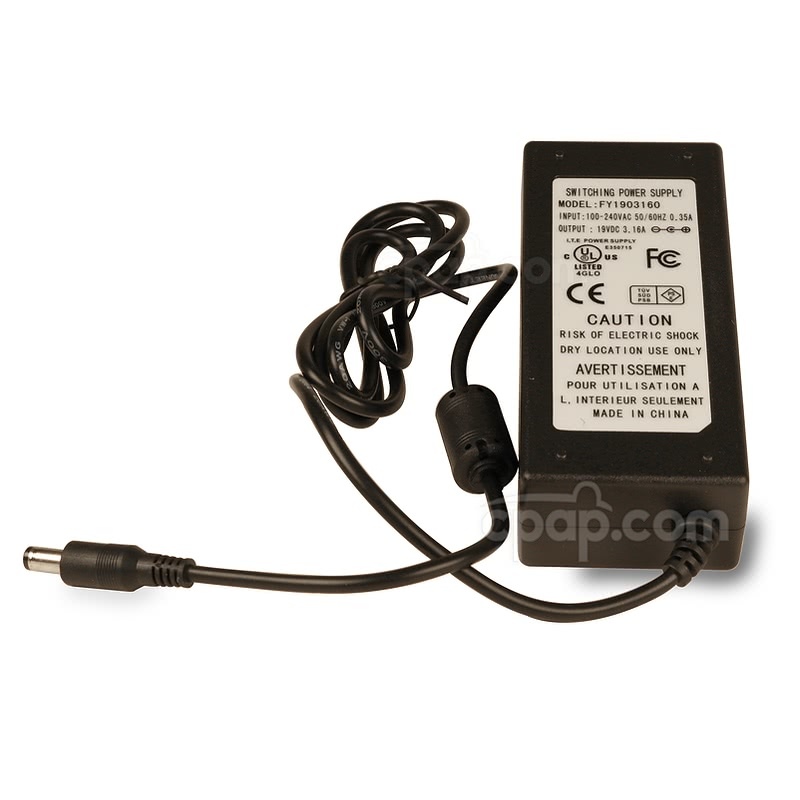 Visit this page: S9 Machine 24V Power Converter for C-100 Travel CPAP Battery Pack. The equivalent lithium ion content of the C-100 battery cells is less than 8 grams. Disposal: Lithium Ion Batteries Should be Recycled. Dispose of the lithium ion battery in accordance with local regulations. Instruction Booklet: To see the complete instructions, view the C-100 Battery Pack User Guide. BPS FAA Compliance Letter: To view the Battery Power Solutions FAA compliance letter regarding UN Manual Tests and Criteria click: HERE. The user manual included with your battery can be viewed and downloaded here: C-100 Battery User Guide. First Time Charging: Fully charge the C-100 Travel Battery Pack for CPAP Machines prior to first use using the included charger and AC power cord. It is normal for the charger and battery to become warm to the touch while charging. Connect the AC power cord to the power supply (charger). Plug the charger's output cable into the "DC In" port of the battery. Connect the charger to a wall outlet. When fully charged, the "Full Charged" indicator on the battery will light up green. Once fully charged, disconnect the charger from the battery and wall outlet. International Charging: The charger can be used internationally in AC currents from 100V to 240V with appropriate plug adapters such as World Traveler Power Adapter Plugs. Dual Battery Charging: The charger can be used to charge two batteries at once. Simply connect the DC Power Pigtail Cord to the output cable of the charger, then plug the pigtail cable into both batteries. Charging from DC Source: Purchase the optional DC to DC Cable for C-100 Travel Battery Pack to charge the battery directly from a DC source using a cigarette lighter style outlet. Also, the C-100 battery may be charged using an inverter to change DC current into AC current. Plug the charger cord into the standard outlet on an inverter to charge the battery. The inverter must put out a minimum of 60W to charge the battery. Interested in an inverter? Consider the small and lightweight: 150W Modified Sine Wave Inverter for C-100 Travel Battery Pack for CPAP Machines. Choose the connector tip that most closely matches in size visually to the DC connection of the device. Attempt inserting the connector tip into the DC connection. If the correct connector tip is used, it should fit easily and not have to be forced. Once the connector tip with the most secure fitting is found, connect it to the female end of the DC power pigtail cord. If the connector tip is loose, try others that may have a more secure fit. "ON" Lights When Using C-100 Batteries in Tandem With The Pigtail Cord: When running two C-100 batteries connected with the pigtail cord, the "ON" light on the battery with the greatest voltage will light up. However, if both batteries are at, or near the same voltage, the "ON" lights on both batteries will alternate in lighting up. 8 Amps Maximum Power Demand: The C-100 Battery can provide power for devices which require up to 8 amps. As a note, most CPAP machines operate between 0.5 and 4.5 amps. Battery Charge: As with all rechargeable lithium-ion batteries, the max charge held will gradually decrease over time due to use and age. The average lifespan under normal conditions is 400-500 battery cycles. Battery Run Times: Run times will vary greatly depending on several factors: device pressure, use of a heated humidifier or heated tube, use of a inverter or converter, and altitude. When the C-100 Battery is paired with a combination of CPAP accessories and a CPAP machine which is running at higher pressures, power to the device and/or accessories may be disabled. If this is encountered, try removing an accessory such as the heated humidifier or heated tube to decrease the power being drawn from the battery. Because the cell contents are corrosive, do not abuse the battery in ways that could result in them being exposed. This includes dropping, striking, or crushing the battery. The battery should not come in contact with moisture of any kind. Discontinue use of any component, including connectors, cables, or the battery itself that appear to have signs of damage. Use the included charger only. The battery should not be exposed to extreme heat or fire. Explosion may occur. Do not disassemble or incinerate the battery. Use of the C-100 Battery Pack with devices that require higher wattage may result in the battery shutting off to protect from overrun. Store in a cool, dry place out of direct sunlight and away from metal objects and heat.